Everybody’s Scalin’ – Wet Tires « Big Squid RC – RC Car and Truck News, Reviews, Videos, and More! If you’ve been scaling for any decent length of time you’ve probably driven through water in some capacity. Whenever it comes to that subject, the discussion usually centers on whether your electronics can handle it or not. Rarely are the tires a concern…but they should be! 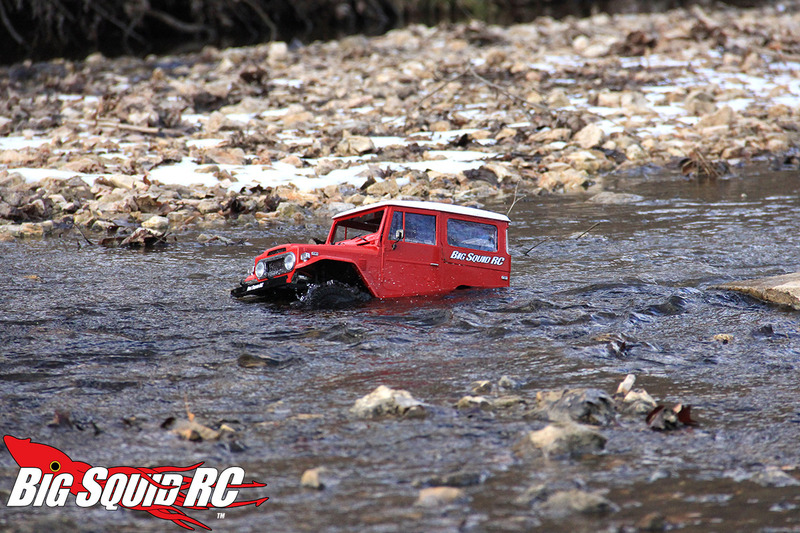 Waterlogged tires can really drag down the performance of your rig. They can get really heavy, which stresses your axle parts, and when your foams get saturated they’ll be soggy and won’t work correctly. Depending on the material of your wheels, you could also run into a rust problem. This is an issue we deal with a lot around here due to the fact that water testing is a necessary component in almost any scaler review nowadays. If it’s listed as waterproof, we have to test that out. Of course, clear mud also just happens to be one of my favorite things to run through as well! If you want to play in water, avoiding this issue isn’t easy. Properly sealed bead locks or fully glued tires can keep most of the water out, but given that most wheels are vented, it’ll still get in. The deeper you go in the drink, the more that will surely seep in. If you have bead lock wheels, this problem has an easy fix- remove your tires and let the foams fully dry out. When you finish running, make sure to keep squeezing your wheels and let water flow through the vent holes until it stops coming out. This can take awhile. Something else that helps is poking a couple tiny holes in the rubber carcass as close to the center line of the tire as possible. Water gets in easier, but it should also be easier to remove. A bonus of this is that just running your rig can help the foams dry out as the natural rotation of the wheels will allow water to work its way to the center and then seep out. This can be very noticeable if you have good wheel speed. The problem with this is that unfortunately you just have to hope to get most of the water out as it will be almost impossible to get it all. You also have the option of sealing your vent holes. Doing this, along with making sure the glue job is solid around both sides of the wheel, can make your tires relatively waterproof. The issue here is that because your wheels aren’t vented, their’s a good chance your truck may feel bouncy because the tires can’t collapse on obstacles like they should. My recommendation? Just get a set of good aftermarket tires and bead lock wheels. The ability to go wading through water with the option of easy clean-up and drying is just another reason why bead locks rule. Oh, one last thing- make sure to dry off your steel screws! Many folks get a set of fancy aluminum wheels and figure they don’t have to worry about rust. That’s true of the wheels, but the actual hardware is usually made of a cheap steel. That stuff oxidizes fast. Dry it off after running to avoid it! Alright folks, that’s all for me this week. Have a good one and stay dry.